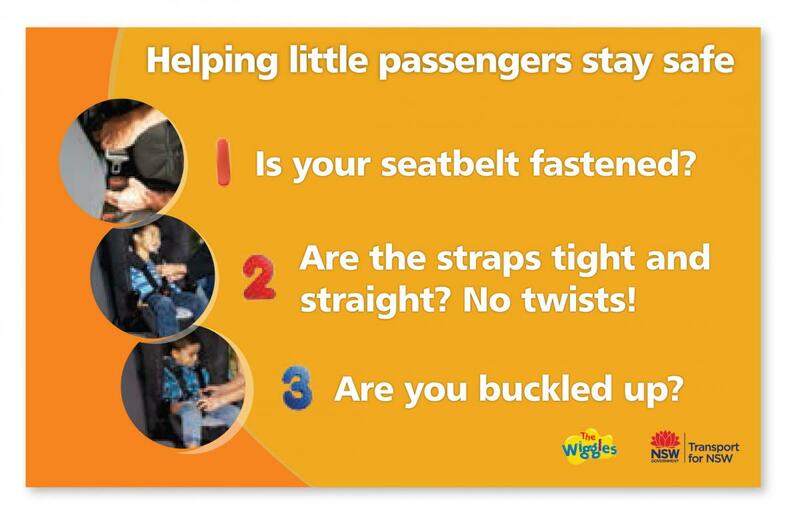 The Wiggles are helping little passengers stay safe. Sing along to Are You Buckled Up? to encourage the three simple steps for using a child car seat or seatbelt. When buckling up your child car seat, there are three easy steps to follow that will help keep your children safe. Did you know two in three child car seats are not being used correctly, increasing the risk of serious injury. Our research shows that children who are restrained incorrectly are up to seven times more likely to be seriously injured in a crash than children who are fitted in the correct child car seat for their age and size. Always follow the manufacturer's instructions carefully when fitting the child car seat and placing your child in it. If the instructions have been lost, contact the manufacturer, search for the instructions online, or seek advice from specialist Authorised Restraint Fitting Stations. Adjust the inbuilt harness for a comfortable but firm fit, with no slack. The harness straps should be straight and in flat contact with the child. Double check the harness straps are not twisted or caught. In booster seats, make sure the sash belt crosses your child’s shoulder and is in contact with the chest. Make sure the lap belt sits low across the pelvis. Nino: Choosing and using the safest restraint or booster seat for your children can be trickier than you think. Nino: In this episode, we’ve asked parents using a rear facing restraint to video themselves as they attempt to get it right. Jess: This is the base of the baby capsule. Chris: And you’re going to show us how to fit it, right? Jess: Yes. I’ve done it a few times, we should be alright. Chris: Show us how it’s done. Jess: OK, so I’m just going to grab this seatbelt and pull it as far as it will go. Jess: I just need to thread it through here, trying to make sure that it doesn’t get all tangled. Jess: Now I just need to make sure it’s tight. I need to push down on this. Jess: I think that’s as tight as we will get it. Jess: Hello Emily, say Hi to Daddy. Chris: Ready to be a movie star Emily? Jess: Let’s get you in this capsule. Good girl. I think she’s starting to get a little big for this capsule. Jess: We’re going to get her arms through these straps. Now we can buckle her in. Chris: Better make sure that you get that right. Chris: OK, we’re on the home stretch now. Chris: There we go, beautifully done. What else do we need to do here? Jess: We need to do up this strap then we’re almost ready to go. Clip this one in. Chris: She’s been well behaved. Nino: Hi Jess, how did you go? Nino: And one last thing to check here is the shoulder height. Emily is almost at the limit here so it won’t be long before she needs to move on to the next seat. Nino: But apart from that it’s looking really good. Chris: What score would you give us? Nino: I think 9 out of 10. Job well done. Nino: This young Mum and Dad have a 4 month old daughter and they’re using a rear facing convertible. Nino: It’s convertible because it can face forward as well. But because little Eimer is too small, they’re still using it rear facing. Kay: OK make sure that you do a good job, you have to get us a good score. Kay: Can you give us a bit of commentary? Nino: What are you up to today? Nino: And what have you done here? Nino: Would you like me to have a look? Killian: OK so how did I go? Kay: Well done. So what’s our score Nino? Nino: That’s a pretty good score. Have a great afternoon. Nino: In this episode, we’ve asked parents using forward facing restraints to video themselves as they attempt to get it right. Bruce: Are you going to your Mum’s house? Sarah: Yes, we’re heading to Mum’s for lunch. Do you want to come? Bruce: No I think I’ll give it a miss today, the football is on. Sarah: I’m going to put you in the car Archie. Good boy. Sarah: I’ve put him in and I’m going to buckle him up because want to get top points here and beat the other couples. Sarah: I’m going to buckle him in nice and tight. Bruce: It’s starting to look a little tight on him. Sarah: I think it’s better if it’s a little bit tight. We want to make sure that it’s perfect and he’s nice and secure. Sarah: There you go Archie, good boy. All ready to go. Bruce: Alright, we’re going to send in Nino to check your work and see how you’ve done. Sarah: I think we’re ready for him. Sarah: Hi Nino, how are you? Nino: Hi Sarah, I’m well and you? Nino: Do you mind if I have a look? Sarah: Sure, go ahead. I think it looks pretty good. Nino: At a glance the seatbelt is done up pretty good. The harness buckle is done up good. Nino: You can see that one of the harness straps here is twisted. We need to have that running straight so I can fix that for you. Sarah: So does it need to be straight on both sides? Nino: And it’s adjusted correctly because I can get both fingers between Archie and the harness. Nino: The other thing to check here is the tether strap adjustment and that feels good. Nino: One other thing I need to check is the seatbelt just to make sure it’s been routed correctly. Nino: The seatbelt is twisted so we need to get that in the right position. Nino: If the seatbelt’s not routed correctly, in the event of a crash it won’t perform the way it’s designed. So, I’ll just make sure that it’s routed right. Nino: Now that’s in place so well done. Bruce: So how did we go? Nino: Overall, fairly good. Given there were two twists in the strap I’m going to have to mark you down to 7 out of 10. Sarah: Thanks Nino, 7 is not so bad. Nino: Some forward facing restraints can be used as a booster by removing the inbuilt harness. Nino: This dad is being videoed by his wife as he prepares the restraint for his daughter Sarah. Mary-Ann: Are you off to the party. Marc: Yes and we’re very excited. Mary-Ann: What are you going to demonstrate for me today? Marc: How to put our child safely into our car. Mary-Ann: Well Marc, you’re the expert. Marc: Yes, I am indeed. Marc: Pull that out and put your arm in there. We need to make sure this is nice and straight. Marc: You put that buckle in. I’ll help you twist it around. Marc: That’s it, now the next one. She’s doing a great job. Marc: Let me do that. Twist that around. Marc: Let me fix that up. Mary-Ann: Marc, do you think she might be ready to go into a booster? Mary-Ann: Maybe we need to check with Nino and see what he thinks. Marc: Maybe not a bad idea. Marc: Hi Nino, how are you? Nino: Hi Marc I’m well, and you? Marc: We’re off to a birthday party but we need to know whether Sarah is big enough for a booster. Nino: Should I have a look for you? Nino: You’re quite lucky with this restraint as it has shoulder height markers and she falls within that range. Nino: This restraint is the safest type for Sarah. Nino: I’ll just keep checking if that’s OK.
Nino: The seatbelt is done up correctly. Nino: The harness buckle is done up correctly, I might just slip these pads up a little to the shoulders. Nino: I’ll check the harness adjustment. I can get two of my fingers under the harness straps so that’s good. Nino: The last thing to check here is to make sure the tether strap is done up correctly. Nino: It’s hooked up correctly. That’s good because lots of parents forget to do that. Marc: Great, so what did we get out of 10? Marc: 9.5 out of 10, what do you think? Nino: These parents have done a good job at keeping their kids safe. Nino: Next time we will be looking at parents who use booster seats for their children. Nino: In this episode, we’ve asked parents using booster seat to video themselves as they attempt to get it right. Liz: Hi Elle, hi Joshua. Elle and Joshua: Hi Liz. Liz: Are you looking forward to coming to have a play with Jacob today? Liz: Are you going to put him into my car? Elle: Yes, I’ll put him in now. Elle: I’ve put Joshua’s booster into your car. Liz: That looks like his car seat. Elle: It’s exactly the same seat, I’ve tucked away the straps from when he was using it as a forward facing restraint. Elle: It just clicks in like that with the seatbelt, tight across his hips, across here. Elle: This clip goes in between his legs there. Now, sit back Joshua, make sure this is nice and snug here. How does that feel? Liz: That looks great, let’s get Nino in to have a look. Nino: Hi Elle, How are you? Nino: What have you done today? Elle: I’ve put the booster seat in. Nino, can I have a look for you? Nino: Hi Joshua. Joshua: Hi. Nino: OK, the first thing to look for that the seatbelt buckle is done up correctly. Nino: Then there’s the anti-submarining clip. This is very important. Some parents don’t use this and they must. Nino: The seatbelt path across the shoulder is correct and that’s all set up right. Nino: There is a tether strap adjustment at the back so I’ll just have at it. Parents need to be careful that the adjustment is not too tight or too loose and that is spot on. Nino: Then there’s the seatbelt guide at the top of the headrest here with the red indicator showing where the seatbelt should run over the child’s shoulder. Nino: last thing to check is the headrest. It’s in the right spot at the moment and as Joshua grows it something that you can adjust and it will go up with his height. Nino: That’s looking really good, well done. Nino: Thanks Nino, what rating would you give Elle? Nino: I think she’d get a 10 out of 10. Nino: This Mum Jodie is being videoed by her husband as she prepares the restraint for her son Harvey. Dean: Where are we off to? Jodi: Going to the shops to get the boys some new shoes. Dean: So Harvey is going in his car seat? Dean: Does Harvey really need to be in his booster seat? Jodi: Yes, it’s the safest thing for him and he still fits properly. Dean: Nino’s coming so what do you need to do to buckle him in properly? Jodi: Make sure his straps are nice and straight and tight; and make sure that the hooks put on properly. Jodi: Have you got it? There you go mate. Jodi: What do you think? Does that look nice and tight? Dean: Yes, that look great. Jodi: Excellent, let’s get Nino then. Nino: Hi Jodi how are you. Jodi: Hi Nino, how are you? Good. Nino: What are you all doing today? Jodi: We’re going to the shops and I’ve put Harvey into his booster seat. Nino: Is it OK if I have a look at what’s going on? Nino: How are you Harvey? Dean: How does it look Nino? Nino: It’s looking pretty good. I’ll just check a few things for you here. Nino: Second of all the buckle across the lap is in use which is really great. Nino: Importantly the seatbelt is running through the seatbelt guide. Nino: Over here you can see the shoulder height indicator adjustment which is spot on. Nino: The last thing to check is the tether strap. That’s secure and adjusted correctly and that’s something that parents forget to do so well done Jodi that’s looking really good. Jodi: So how did we go? Dean: How would you score us? Nino: You used all of the straps correctly and Harvey is still using the booster seat which is fantastic and really important, I’m giving you a 9 out of 10. Jodi: Thanks, see I told you I could do it. Nino: I’ll let you go and do your shopping. Nino: Everyone’s done a great job on correctly using the booster seats. Nino: It’s worth remembering that your child should continue using their booster seat until they’re outgrown it.